In the middle of the shopping and parties and baking as we get ready for the birth of the Divine Child at Christmas, I think it’s important to pause for a minute and reflect on some ways we can honor those who did not get a chance to be born. In all wars, we need to pause the fighting and propaganda to take just a minute to remember the fallen— in this case, those lost through the horrors of abortion. 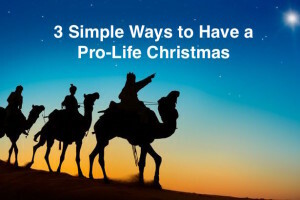 So I propose three easy things anyone can do to have a truly pro-life Christmas and honor the memory of our lost generations. In doing these, perhaps the most important thing to consider is the message we are giving our own children. Regardless of our instruction on the matter or our protests outside clinics or our dutiful donations we send off every month, children of pro-lifers are not necessarily guaranteed to follow in their parents’ convictions. But by somehow making the loss felt and the individual lives meaningful through simple, tangible means, our children may be nurtured in a very real way to consider the tragedy of abortion as a grave injustice against all human beings. 1- Light a candle on Christmas Eve and place it somewhere prominent as we wait for the birth of the Divine Child. Explain to your family that the candle symbolizes all those who never got to experience Christmas. No need to get into graphic detail or make it a macabre sentiment, just a simple light flickering in the home to be grateful for our own blessings and to remember those less fortunate. 2- Give gifts to a local crisis pregnancy center. This is especially fitting around the time we celebrate Epiphany: when the three kings brought their gifts to the Baby Jesus. Traditionally this is celebrated January 6th, but any time during the Christmas season would be wonderful. Let your children help shop for and select a couple items to donate to mothers in need. Outfits are always fun but things like carseats and diapers are usually in high demand also. This can be an individual gesture or you could go big and organize a community-wide baby shower for a particular center also. 3- Cultivate memories, not stuff. It may not be readily apparent how fighting a consumerist mentality helps the pro-life cause, but I think the correlation is important. When we buy more toys and things and “stuff” for our children, we inadvertently start to foster a materialistic mindset. Christmas is easy to commodify, budget for, digest and dispose of before we can really put the brakes on the matter. We all know it’s not the stuff that matters or the gifts that matter but the PEOPLE who matter. And to honor and love PEOPLE, I think we ought to spend more time thinking of ways we can spend time with them, create intentional moments with them, honor life with them. Instead of the 9 foot Barbie dollhouse, take your daughter ice skating. Instead of giving iTunes gift cards, take your son to a real, live concert. Instead of buying the two-headed Monster High doll (I kid not, God have mercy), go to the zoo instead. You get the idea. The bottom line is that we want to raise children who believe that life is precious. And a precious life is best taught when it is intentionally lived… and that’s something that can’t be bought, wrapped up or put under the tree. Honor unborn lives by living yours to the fullest. and teaching children to savor theirs. Merry Christmas.